I’d like you to meet the most disruptive force on earth. With one pen stroke it can ruin a business, crash a stock, and wipe out shareholders. 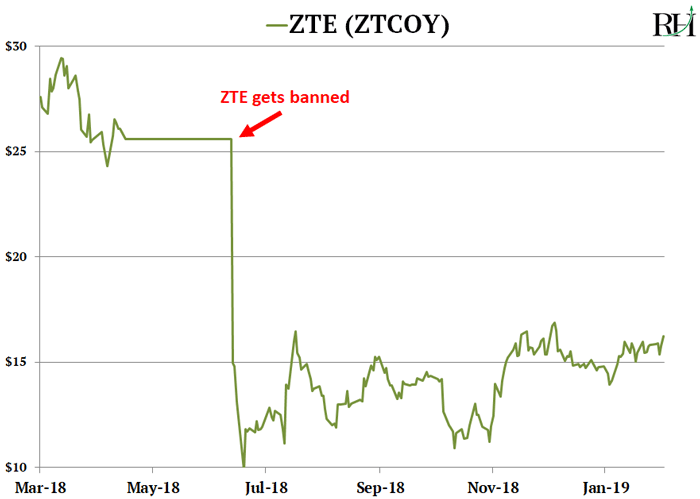 Last April it shocked the world when it banned Chinese phone maker ZTE (ZTCOY) from doing business in America. And this time two “forgotten” stocks stand to hand investors big gains in the fallout. As ZTE shareholders found out the hard way, the most disruptive force on earth is the US government. In 2017 American officials discovered that ZTE was selling phones to US enemies like North Korea. The US government told ZTE to stop. It refused… so lawmakers banned ZTE from doing any business in America. ZTE had been manufacturing roughly 25% of its phone parts in the US. So the ban crippled its business overnight and sent shares plunging to a 55% wipeout in two weeks. As you may have heard, Chinese phone maker Huawei stands accused of putting secret “backdoors” into its phones. If true, these backdoors allow Huawei to spy on Americans who use Huawei phones. Although Huawei is officially a private company, it is widely known to be an arm of the Chinese Communist government. The US and China have been squabbling over this for a while. But the situation has reached its boiling point. Within the next couple of days, President Trump is widely expected to sign an executive order outlawing Huawei products in America. Keep in mind, Huawei isn’t some rinky-dink company. It sells more phones than Apple (AAPL) and generates as much revenue as Microsoft (MSFT). But most importantly, Huawei is the world’s largest maker of 5G infrastructure. If you’ve been reading RiskHedge, you know why this is crucial. 5G is the new lightning-fast cell network our phones will soon run on. And the “Great Upgrade” to 5G is one of the largest infrastructure projects in history. Giant corporations like AT&T (T), Verizon (V), and T-Mobile (TMUS) must spend hundreds of billions of dollars to upgrade their networks to 5G. Until recently, Huawei was first in line to receive much of this windfall. It had secured $100 billion worth of 5G contracts—over five-times more than any of its rivals. But with Trump expected to ban Huawei, almost all of Huawei’s 5G infrastructure contracts have been cancelled. AT&T cancelled its 5G deal with Huawei last year. UK based Vodafone cancelled its 5G contract with Huawei this year. The governments of Japan, Australia, and New Zealand have stepped in to ban their cell companies from working with Huawei on 5G. 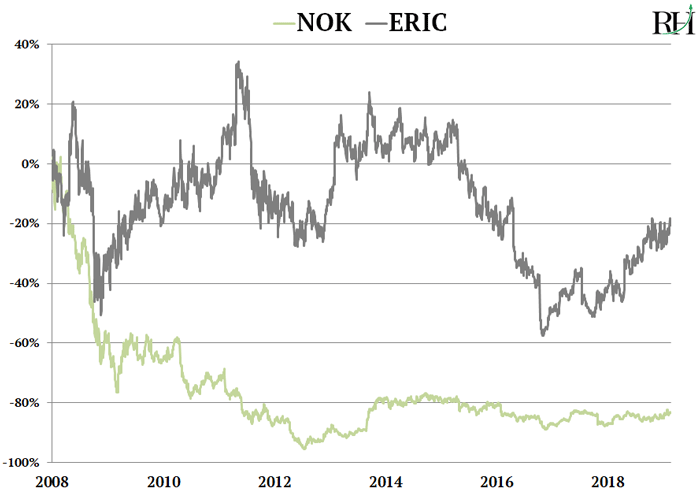 With the world’s #1 supplier blacklisted, billions of dollars are set to flow to Nokia (NOK) and Ericsson (ERIC). You might call these two “forgotten” stocks. Not all that long ago they dominated the cell phone market. According to leading research firm Gartner, Nokia alone controlled 50% of the phone market in 2007. Today it controls less than 1%. And Ericsson shut down its phone business years ago. But Nokia and Ericsson are two of the world’s only makers of 5G equipment. According to IHS Markit, Nokia and Ericsson control 50% of the 5G infrastructure market. Ericsson… Nokia… Huawei… and ZTE. As I mentioned, Huawei and ZTE are essentially banned from the Western world. Which means phone companies have little choice: They must work with Ericsson and Nokia to get 5G up and running. Both Nokia and Ericsson recently won multi-billion dollar 5G infrastructure contracts from Verizon and AT&T—the two largest US phone companies. And 3rd place T-Mobile has agreed to pay Nokia and Ericsson $3.5 billion each to build its 5G networks. In short, Nokia and Ericsson have been handed the giant 5G infrastructure market on a silver platter. When Nokia reported earnings two weeks ago, its network equipment sales shot above $6 billion for the first time in five years. Meanwhile Ericsson’s 5G-related revenue jumped 10% last quarter. The market is beginning to recognize both companies will be big winners from the 5G buildout. After a decade of being stuck in the mud, Ericsson’s stock has surged 50% in the past year. Nokia stock has climbed 20%. As the 5G rollout kicks into high gear, both stocks are low-risk, money making opportunities. For example, Nokia sold around $20 billion worth of network equipment last year. My research shows this should jump above $50 billion in the next two years as 5G ramps up. So no matter what happens with the stock market, a tidal wave of money is about to flow into Nokia and Ericsson. That’s all for this week. Are you planning to buy a 5G smartphone when the first one comes out later this year? Tell me at stephen@riskhedge.com.